The folks at Paramount love me. I can think of no other explanation for the launch of their Centennial collection line. I suppose they might have other reasons, but it does appear to be a result of their love for me. Reissuing Sabrina (as well as several other top notch titles) is a gift to me. In my own humble opinion, Sabrina is one of the finest romantic comedies ever made. With the exception of some of the works of Richard Curtis, I can’t think of a one that matches it. As I said, that is simply my opinion. It is possible that one might disagree, but that would suggest insanity or stupidity. Humphrey Bogart and William Holden star as Linus and David Larrabee, heirs to the massive Larrabee Empire. While Linus, the older of the two, spends his time building the fortune and expanding the empire, David enjoys life, ladies and drink. Audrey Hepburn plays Sabrina, daughter of the Larrabee chauffeur. Sabrina is a teenager and is in love with David. One night, after realizing that David will never see he is meant to be with her, she makes a clumsy attempt at suicide (She starts up all of the cars in the closed garage). Linus comes across her, stopping things before it is too late. Shortly thereafter, Sabrina is sent to Paris, to learn to cook and forget about David. The Sabrina that returns (two years later) is a beautiful, stylish lady…and still in love with David. BUT, David not only notices her, but sets his sights on her. The problem is that he is engaged to the daughter of a sugar cane grower that is close to signing a huge deal with the LArrabees. David was quite fond of her, until he heard the sounds of wedding bells. After having to clean up David’s previous marriages (four total), Linus is not about to let David wander away, in pursuit of another pretty face. Linus keeps Sabrina busy, but soon finds his own heart, dusty from lack of use, being touched by the sweet young lady. Billy Wilder struck absolute gold with his casting here. Humphrey Bogart, Audrey Hepburn and William Holden all deliver stellar performances, each very different, but equally great. Not only does each nail their role, but have chemistry with each other (Despite some very real clashes on set). With other people in the roles, Sabrina could be seen as a girl willing to ruin an engagement to fufill her own dreams, and David a drunken womanizer (Which, he is). But Hepburn and Holden deliver such charming performances that both are engaging and delightful. And anyone that says that Bogie always plays Bogie has not seen this film! No mention is made as to whether or not Sabrina was restored, but the quality is very nice. I am guessing that at least a little clean-up work was done since there is none of the usual signs of print wear. If there is one complaint I have, it is that we are not taken behind the scenes very much. Sabrina had its share of issues. The cast often clashed, with Bogart unhappy with Hepburn getting the lead over Lauren Bacall. Holden and Hepburn reportedly got a little too close on set as well. It would have been nice to offer up a doc on the making of the film and its place in history, something that talked about the behind the scenes issues. Audrey Hepburn: Fashion Icon runs seventeen minutes and looks at the unique style of Ms. Hepburn, with comments from various fashion designers (Being a guy, the only name I recognized was Isaac Mizrahi) and also looks at some of the lines that have been inspired by AH. Sabrina’s World (11:25) looks at the real-life mansions of Long Island, the very places that make up the setting of the film. Supporting Sabrina (16:32) is about the character actors that make-up the rest of the cast. All do a nice job, but Walter Hampden is very entertaining as the father of Linus and David Larrabee. This segment talks about them and looks at some of their other performances. William Holden: The Paramount Years (24:40) talks about Holden’s career. He started as a contract player for Paramount and eventually becoming a major star. This is not really about Sabrina, though it does make mention of it, but rather about Holden himself. We get various photos and film clips, as well as comments from friends and co-workers. In addition to his film work, it also covers his work to preserve animals from extinction. Audrey Hepburn: In her own words comes from the 2001 release and looks at the film. Behind the Gates: Camera (5:07) looks at the various film cameras and equipment used. Paramount in the 50s (9:35) looks at the other titles in the Centennial collection, including Sunset Blvd and Roman Holiday. Finally, we get a stills gallery that is broken down into four areas: Production, The Movie, Publicity, and The Premiere. The extras we do get are nice, but more could have been done. Simply put, this is delicious, but I want more. 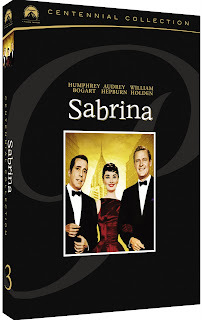 Anyone that enjoys romantic comedies MUST own Sabrina, as it will touch even the hardest of hearts (and funny bones).